BOSTON — Director Larry Coen and actress Celeste Oliva both scored in last season’s hit “Chinglish” at the Lyric Stage Company. Why break up a strong team? They have teamed up again, and the result is an equally delightful production of “Becky’s New Car” at the Lyric Stage Company through Dec. 22. “Becky” is offbeat comedy by Stephen Dietz with interesting characters put in interesting positions by Dietz. At the heart of it all is Oliva , an engaging, likeable actress with stage presence as Becky Foster, a woman approaching middle age who is stuck in a rut and ready to do something about it. When a woman wants new shoes, she actually wants a new job. But if she says she wants a new car, it means she wants a new life. It’s not that Becky is despairing or actually hates her life. Oh, son Chris (Alex Marz) is a bit of a slacker, not much for picking up after himself still chugging along towards a degree at the age of 26, and the psychology major may erupt in an impressive string of psycho-babble at any moment. Joe Foster (Mike Dorval) is even-keeled and kind, a hard-working roofer. Not much has changed in the 28 years Becky and Joe have been married as she divides her time between home and her work at the car dealership. But change is in the air and after 28 years of marriage, kind and even-keeled don’t have the appeal they once had. Into Becky’s life walks a wealthy widower named Walter Flood (Will McGarrahan), looking for Becky’s help in making a last-minute large purchase. A mix-up has him believing Becky is a widow, and he is interested … very interested. There is no fourth wall. Audience members are invited to participate in Becky’s on-stage makeover, and later will vote on whether she should take the leap and accept Walter’s invitation to visit him at his home — several hours away. Soon Becky is living two separate lives, spending time with the exciting and new the comfortable and old. There are some fine supporting performances including Jaime Carillo is Steve, the auto salesman at the dealership permanently scarred from having seen his wife fall to her death. Samantha Richert is Kenny, Walter’s daughter, who hooks up with Chris Foster to make Becky’s life even more complicated, while Kortney Adams plays a down-on-her-luck female friend of Walter’s who wants what Becky has — permanently. It is impossible to dislike Becky — or Rebecca, as Glass prefers to call her — even when she in the throes of adultery, lying and cheating on her very decent husband and living a double life. It’s all played out on an intriguing scenic design by Shelley Barish, with Becky’s life laid out on a game board that resembles The Game of Life I played in younger days. Eventually it all comes crashing down and Becky finds herself driving away from both her lives as Joe and Walter find each other in the same place at the same time and, after comparing notes, lick each other’s wounds over a few beers. When Becky finally returns, she is chastened and getting back with Joe isn’t a sure thing. Can Becky’s marriage survive? Will she return to Joe or go for the glamour of Walter? Thanks to Dietz’s skillful drawing of the character, Coen’s direction and Oliva’s acting, we find ourselves still rooting for Becky to find happiness, even as she scrambles to save her marriage. 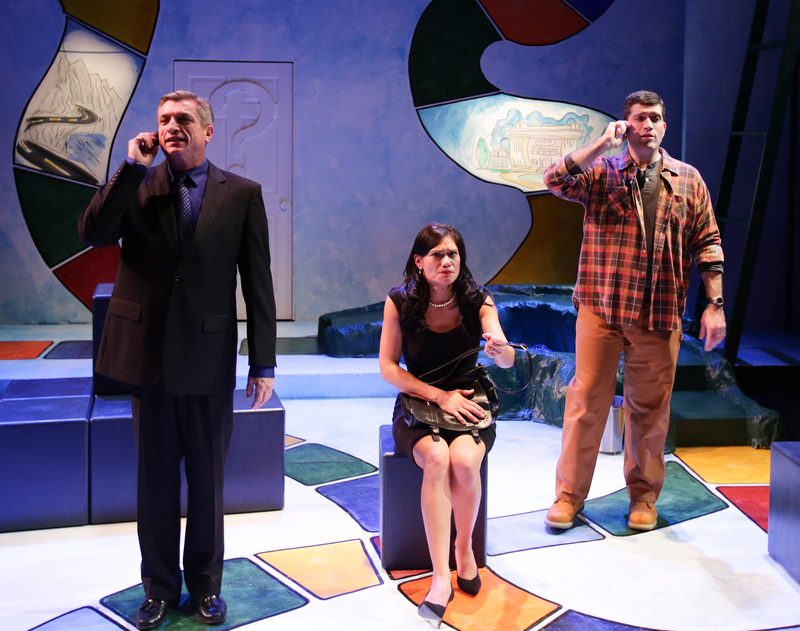 The Lyric Stage Company production of Stephen Dietz’s “Becky’s New Car.” Directed by Larry Coen. Scenic design by Shelley Barish. At the Lyric Stage Company, Clarendon Street, Boston, through Dec. 22. http://www.lyricstage.com.